One of Russia's largest banks is poised to rectify the disappointing results of its I.P.O. 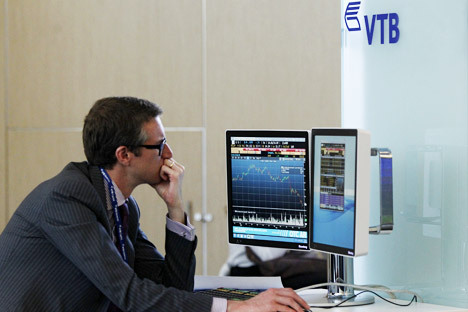 VTB is planning to buy back shares from holders at the offering price – almost twice the current market value. In 2007, VTB floated 22.5 percent of its shares by public subscription at 13.6 kopecks per share, raising over $7 billion from the flotation. The action, called a “people’s I.P.O.” was meant to give the Russian public a chance to invest in state companies and the issue proved extremely popular. However, in the crisis years that followed, the bank’s share price dropped by almost half, and is currently trading at 7 kopecks. Participants in the I.P.O., many of whom were novice or unsophisticated investors, were outraged and claimed they had fallen victim to fraud. Rumors of a possible buyback have appeared from time to time, but V.T.B. always dismissed the measure as economically unsound. However, during the Russia 2012 economic forum in February, Russian Prime Minister Vladimir Putin recommended that VTB reconsider the subject. The bank then finally agreed to buy back shares from I.P.O. participants at the offering price. Few shareholders have managed to hold on this long; most of them have already sold the stock. V.T.B. estimated that the bank will have to repurchase less than 1 percent of its share capital at the cost of roughly half a billion dollars. Still, the buyback is likely to be a painful experience, said Alexander Lebedev, businessman and owner of the National Reserve Corporation. He expects V.T.B. to be swamped with claims, since third-party interests will likely surface along with complaints about the number of shares subject to the buyback and the form of compensation. V.T.B. Bank President Andrei Kostin, however, has announced that the odds of aggrieved shareholders winning any lawsuit against V.T.B. over the buyback scheme are extremely low. Prime Minister Putin welcomed the decision. “The management has arrived at a fair and morally balanced solution,” Putin said after the announcement, and minority shareholders have hailed the bank’s move. But major shareholders and partners appeared befuddled – first and foremost GDR holders, who are mostly foreign investors. But Bank of Russia Deputy Head Alexei Ulyukayev is sure that the misunderstanding will soon be overcome. “The fact is that the transaction has no material financial value, since half a billion dollars is by no means a significant amount for the bank’s capital or dividends,” Ulyukayev said. Rating agencies also do not predict that the buyback would have any negative impact on the bank. “These facts, although negative in essence, will have no material influence on the bank. Furthermore, VTB will be free to float the shares again later,” said Fitch analyst Alexander Danilov. And the bank is indeed planning to float some shares as well as partially transfer them to its top managers as a bonus, said Vladimir Tarachev, chairman of V.T.B.’s Shareholder Advisory Council. In making this decision, the bank rejected the premise of the initial I.P.O., saying that the idea of increasing the number of individual minority shareholders has been a failure. “Selling shares to the public directly is unreasonable, so I believe that the reduction of the number of individual shareholders through the proposed buyback is well justified,” Kostin said. He also emphasized that the proposed buyback was above all a move aimed at reinforcing the image of the bank’s brand by “alleviating the negative attitude towards V.T.B”.